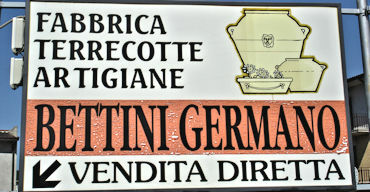 The Bettini family has been producing terra cotta and majolica for centuries (1800). The craft has been handed down from father to son up to the present day. 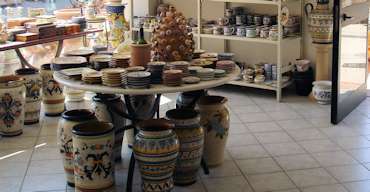 Our age-old experience has always enabled us to produce a wide range of pottery for gardens, balconies and interior decoration. The warm and refined elegance of our products, which makes them ideal for all places, is the result of carefully chosen clay and skilful craftsmanship. 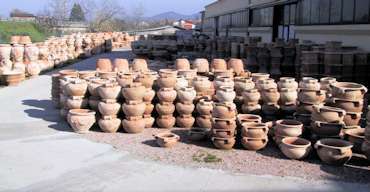 The ancient-looking light colour of our terra cotta pots is typical of the Umbrian tradition and recalls the "ziri" (jars), once used to store olive oil, and the "scine", pots where linen was bleached with ash and hot water. Our pottery quickly takes on an antique look thansk to the delicate shades of the clay; each object is unique because it is made by hand and the colour is never the same. A correct drying process, a stage which is often understimated, makes the product hard, porous and weather-resistant and creates the best conditions for plant transpiration. Firing is another fundamental stage. 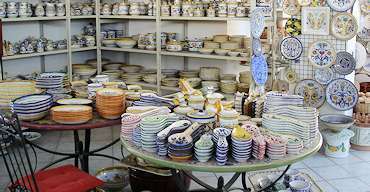 Today, thanks to technology and the skill of kiln-masters, the firing time and temperature are carefully controlled but, everything is still done following tradition. In fact nothing or little can be invented in a craft whose origin is lost in the mist of time. We can just try to improve our craft, following the example of our elders, in order to meet the requirements of our customers and make tradition live on. The Bettini family is proud to decorate your houses and gardens with their artistic terra cotta. It is impossible to explain the deep emotion we feel any time we see one of our "old" pots enhance the beauty of courtyards, parks, villas and castles in Italy and abroad. There are no secrets in the production of terra cotta works since its essential elements are very simple: EARTH - WATER - AIR - FIRE . What matters is tradition, lore memories and the family. It is impossible to reconstruct the far-off journey which stimulates the desire to be useful through art. A journey which still goes on at Deruta in the Tiber valley, where the Bettini family, with their creaking carts stopped, set up their workshop and organized their everyday life. Here's where they still live. The potter's tools have changed, the craft and the essential elements have stayed the same. Tradition lives on in the memories of the elder craftsman who does not talk very much, but works hard and lavishes time and attention on these magnificent objects whose beauty is brought to perfection when we use them for growing superb citrus trees or unpretentious geraniums. Some comments from Fausto F. a friend of the Bettini Family. All products have high quality and are unique. All products are exclusively produced and decorated by hand in our workshop in Deruta Italy. The special clay clear shades allow the object of grow old quickly, assuming tones more uniform ranging from vessel to vessel, making each piece unique guaranteeing an excellent weather resistance. Each product has a high quality and is unique, being made and hand painted as usual Deruta.